Having time to do our favourite hobbies is one of the best things that we can give to ourselves. It’s a productive escape from reality where we can be happy, relaxed, and even learn something from it. These past time activities can play a big part in our growth as a person as well, wherein we unconsciously enjoy doing things on a deeper level – we learn something significant from it instead of just having fun doing it. And this is what made our August #RoommateOfTheMonth, Kricell a.k.a. Reen Kay, discovered her online learning playground through Sample Room. Despite being a full-time mom of two, it didn’t stop her from doing the things that she loves to be the best and most beautiful version of herself. To know a few more things about our lovely August ROTM, we asked her these following questions: ABOUT REEN KAY 1. Tell us about you and your love for beauty. “I am Reen Kay, 30 years old, and a mother of 2 kids. I am full-time housewife and I love joining online promos. For me, every woman is beautiful. We just need to learn how to have time for ourselves without sacrificing our family's needs because my family is always my first priority.” 2. When did you start and what inspired you to share your beauty finds on your social media accounts? “I just started sharing my beauty finds this year. Online promos and some of my friends inspired me to share my beauty finds because it's fun and it is also a good way for me to past time.” 3. Who are the bloggers that you look up to? “I don't know much about beauty bloggers but some of the bloggers/vloggers that I look up to are Aci Girl, Colz Vidal, Rod Magaru, Rochelle Miko Kawasaki, and Mark Roa.” ON HER BEAUTY ROUTINE 1. Share with us your skincare routine! “I have a very simple skincare routine -- I just wash my face every morning and night, and use moisturizing cream afterwards. Maybe eating fruits and drinking a lot of water every day are also a big help for me to keep my skin healthy.” 2. How about your makeup routine? “I don’t really use makeup. In fact, I don’t really know how to do it for myself. But, I only use makeup occasionally. I just use powder and lipstick or lip tint whenever I need to go out.” 3. What are the top 5 beauty products (skincare and makeup) that you can't live without? “My top 5 beauty products that I can't live without are: 1. Garnier Whitening Serum Cream 2. Ponds Facial Wash 3. Ever Bilena Lipstick 4. Gluta-C Face and Body Soap and Body Lotion 5. CreamSilk Conditioner” ABOUT HER SAMPLE ROOM JOURNEY 1. When did you first find out about Sample Room? “I first learned about Sample Room last February 2, 2017.” 2. How did Sample Room help you in your journey into the world of skincare and makeup? “Sample Room helped me in my journey of skin care and makeup through their free sampling of new products that are about to be out in the market. So, I am able to try it first and see for myself what products or items best suit me and my skin.” 3. What were your best finds that you discovered through our site? “The best finds that I have found in Sample Room is Cream Silk products." 4. Do you see yourself still sampling in Sample Room in 3-5 years? “I can see myself sampling in Sample Room as long as there is Sample Room, because it’s such a big help for every woman like me to get free samples, and try today's best and high-quality products that are out in the market.” 5. Any advice for your fellow roommates for their sampling journey? “My advice for my fellow roommates is to continue supporting Sample Room’s services because all of the free products that I received from them worked best for me. It’s worth the try!” Sometimes, hobbies can take us to places and beautiful opportunities that we never imagined of. With Reen Kay’s love for beauty and for her family, she’s able to discover what suits her best to reveal her true beauty and to grasp lifelong learnings from influential people without sacrificing her tight bond with her family. Take a peek on Reen Kay’s latest beauty posts and activities by following her at @reenkay on Instagram! -- Dreaming to see your name on our featured list of #RoommateOfTheMonth? Well, who knows, maybe you’re the next! 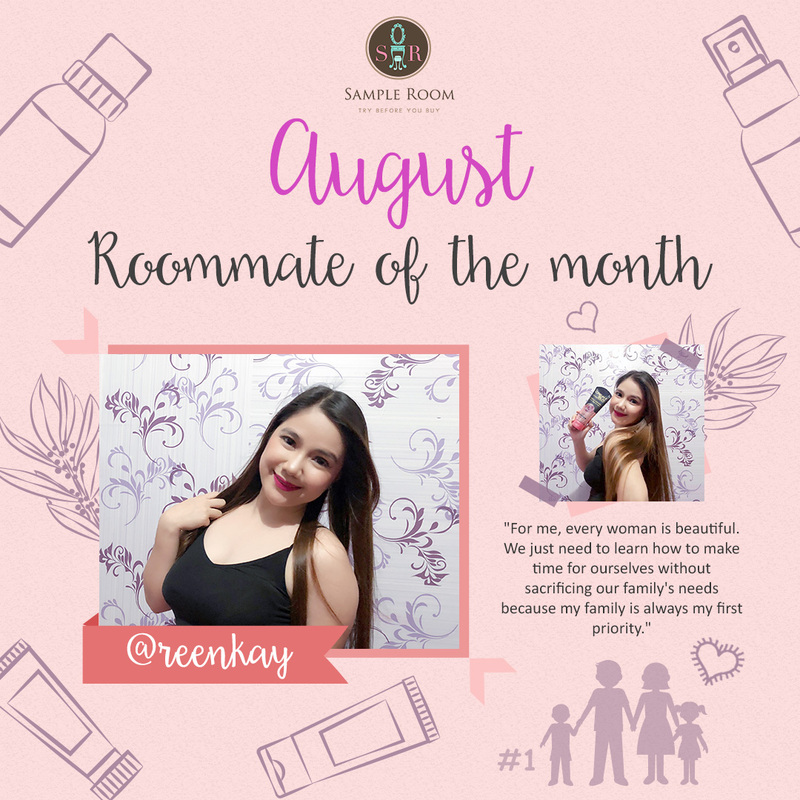 ;) Just don’t forget to post and share your latest Sample Room beauty finds on your blog and social media accounts using the hashtags #RoommateOfTheMonth, #SampleRoomSpotlight, and #SampleRoomPH!